Everything about the Molcajete Mexican Molcajete Lava Stone Mortar and Pestle. Mexican food is one of the richest in the world and it has evolved to such degree that it can no longer be considered a singular cuisine. Each region of Mexico offers a unique blend of flavors and aromas and has its own gastronomy. Oaxaquena, Nortena, Yucateca, Potosina, Poblana, Veracruzana, Sinaloense, Sonorense, Tapatia and Michoacana are just a few of the vibrand strands of Mexican cooking. It is said that a country and its culture ca be known by understanding the diet of its people. Mexican culture is one of the few that, even with the passage of centuries and the external influences, has not lost its culinary identity. today as it was hundreds of years ago with the Mayan and the Aztecs civilizations, the diet continues to be based on corn, bean and chile peppers. Out of these 3 basic ingredients in our diet chile is of special importance and its the common denominator among the different social classes determining the culture of the people. In the XV! century, Friar Bartolome de las Casas said that, "without chile, Mexicans do not feel they are eating". Chiles are the basic ingredients that give flavor, spice and even vitamin C to our lives and the Molcajete is a special utensil very much related to chiles that has been used for more than 5,000 years, the Molcajete is the preferred tool for grinding spices and transforming chile into the most diverse and exquisite salsa. The Molcajete made of volcanic rock is also a powerful icon, reminding us of the natural richness of Mexico and its hand carved contours reminds us of the skillful work of the ingenious craftsmen. The Molcajete (M�L-CA-H�T-�) (molcahete) is the oldest tools used in Mexican cooking for grinding spices, it was used in Meso America by the Aztec and Mayan cultures. the authentic Molcajete es handcrafted from a single block of porous basalt volcanic rock. Molcajetes are typically round in shape and supported by three short legs. The rough surface of the basalt stone creates a superb surface for grinding spices and chiles in spite of time and wear, this surface stays porous, because of the bubbles of air released from the basalt, guaranteeing an ideal surface for grinding. Salsa and guacamole prepared in a Molcajete are known to have a distinctive texture and flavor which is superior to those prepared in conventional blenders or food processors. Molcajetes are also used as serving dishes in restaurants and homes. When the molcajete is heated using an open fire, hot coals or in the oven, it will stay hot for a long time, sometimes for more than 30 minutes. Remove all loose particles of stone from it. Soak it in cold water overnight or at lest for a couple of hours. take some dry white rice (uncooked) and grind it with the tejolote or pestle all over the inner surface of the molcajete. Discard the rice and repeat the process until the rice stays completely withe and not gray any longer. Alternative is to buy a brush with copper bristles and scrape the wet molcajete until you cannot feel any more grit in the water, maybe 15 minutes or so depending of the stiffness of the brush. Never use detergent or dish soap in the molcajete to clean it. You should treat it like you would a cast iron skillet, use plenty of cold water and a soft brush and let it dry out. The Molcajete is used to grind spices and make sauces in every mexican kitchen. They are made by artesans with a volcanic stone. 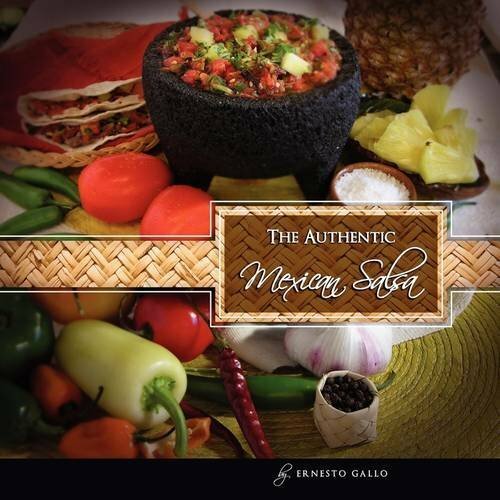 The Authentic Mexican Salsa book also features interesting sections on "The Molcajete" (Mortar) and illustrated sections on �Traditional Chiles of Mexico� and the "Scoville Scale". A must have for a SALSA lover!